I miss that word. It’s fun to say and wonderful to experience. Without so much as a backward glance, I’ve decided to welcome it back into my life. Who says you can’t choose a word of the year in March? After all the start of a new season is just around the corner. I will continue to resist, volunteer, and make my voice heard, but I’m also going to focus on the positives, the synergies and the serendipity in life, no matter how small. Here are a few that make me smile. I enjoy playing Words With Friends, a kind of online Scrabble. Most of my friends are high-scoring players, so though I often lose, I’m improving and enjoying the challenge. I played the word “Tui” in a game with my smart and clever friend Mary Elizabeth who wasn’t familiar with the word. Then a few days later she found these gorgeous tea mugs. Serendipity! ) Thank you once again, ME. 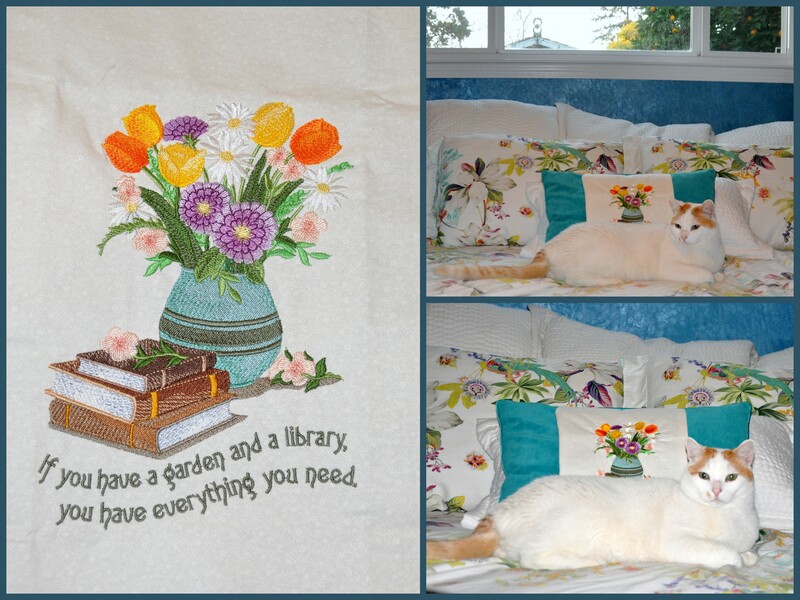 About a year ago, Marlene who blogs at In Search of It All sent me a stunning, machine-embroidered gift. Isn’t it lovely? I debated turning it into a pillow or framing it, so I just let it be for a while. Then I realized that the colors worked beautifully with a small throw pillow in the some-times guest room. (It’s my son’s room but he’s mostly away at college). I ironed the edges and hand-stitched the embroidery to the pillow. Perfection! When my son came home from college for the summer, I planned to store the pillow in a closet. On a whim I took into our bedroom. Serendipity! The colors go beautifully. Thank you once again, Marlene. The third and far less interesting moment of serendipity arrived in a large plastic bag. It was part of the packaging for our new printer. 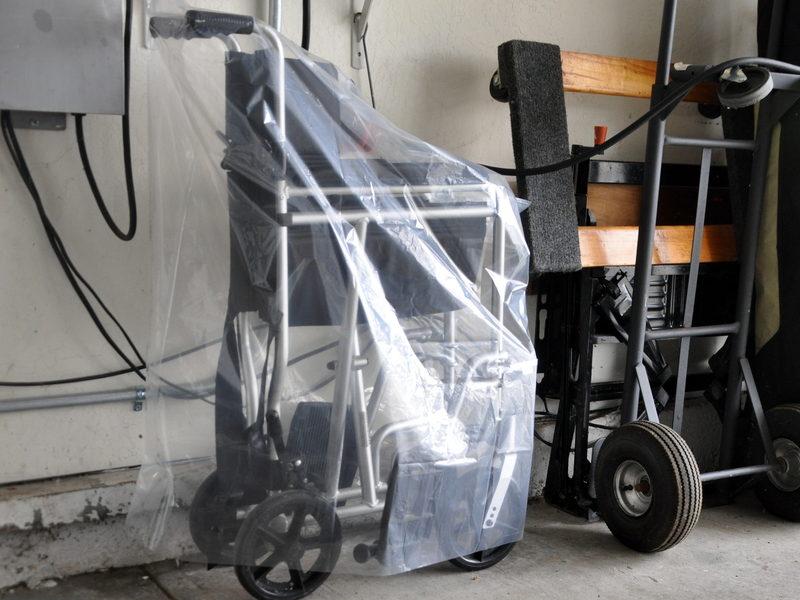 Long story, but I’ve been meaning to make a cover for a mobility chair that lives in the garage along with dust bunnies and bugs. I bought it for my mom in her declining years to help get her to her medical appointments. I kept it after she passed and my sister was able to use it when she first returned from Iowa (she has MS). 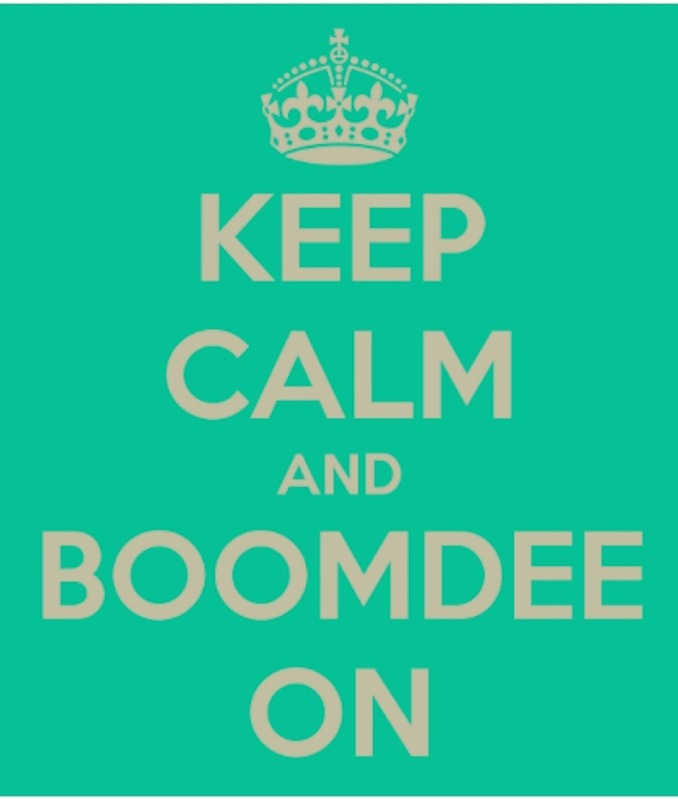 Last year it came in handy for outings when I was recovering from surgery. And I’ve loaned it out several times to a neighbor who’s had many surgeries herself. So back to the printer bag. It’s an odd size, wider than a large trash bag but not that tall. On a whim I tried it out on the mobility chair, and you guessed it, serendipity! It’s the perfect size and shape. It saved me the trouble of making one, it kept the plastic bag out of the landfill, and I like that it’s clear. So how about you? Do you look for these special moments in your life? Lindy wanted to be including in this post. She insists that this shoe box is the perfect size for her girlish figure. Ah…serendipity? This entry was posted in serendipity and tagged In Search of it All, lindy, mobility chair, serendipity, Tui tea mugs, Word of the Year. Bookmark the permalink. 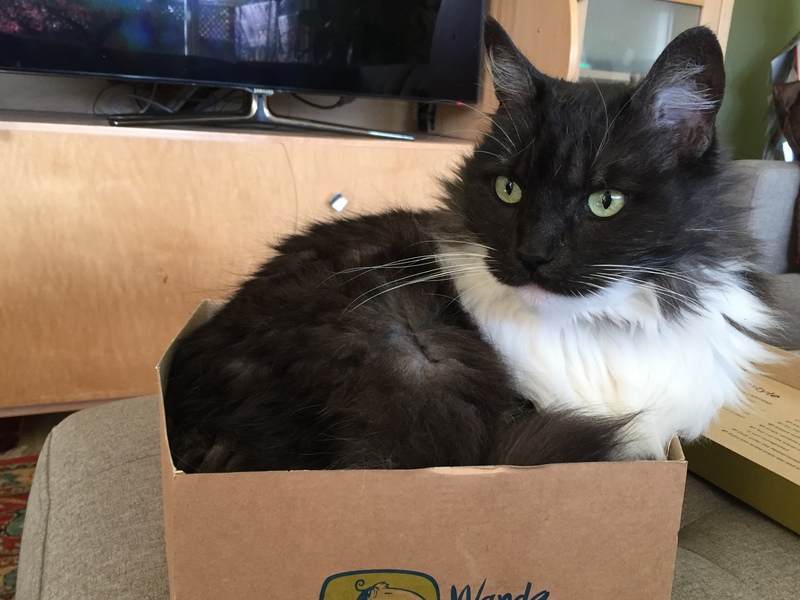 Lindy is so cute – the box is just purfect to squeeze into! Those mugs are gorgeous. You have set me thinking about special moments – I will look out for them – I remember your Serendipitous word the first time round in 2014 and can see why you would choose it again even if it is March – who cares – it made me smile like Boomdeeadda’s Xmas tree! I’m so glad you’re smiling. Lindy is a large cat who never says no to a cardboard box. She squeezed all 16 pounds of herself (7 kilos) into a shoe box, never mind that she was spilling over the sides. 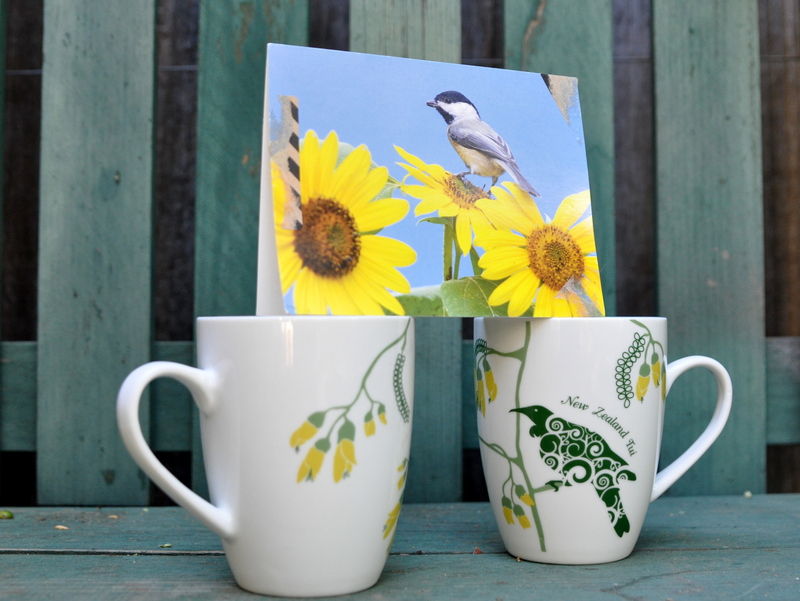 The mugs are gorgeous and they came with a story which makes them all the more wonderful. I’m amazed you remember my word on the first go around. That’s nice to hear. And yes, Boomdee’s x-mas tree/ghost is delightful, too. That is indeed a recognisable tui and kowhai flower – beautifully done! If you are lucky enough to see one while here you will love the oil slick colours that glimmer in their feathers – and be amused by their generally noisy conglomeration of calls. When I lived by the beach I had one who in among it’s whistles and clicks and general clatter, would throw in the sound of a telephone ringing. Marlene’s embroidery is beautiful! Isn’t she clever! And then you went and made it even more beautiful by adding it to that pillow – serendipitous and ingenious! Serendipity is a great word – and it’s a great thing to be on the lookout for isn’t it, because when we focus on something it usually turns up. Pauline, I’m excited to see a tui and a kowhai flower. And to think they’re clever enough to make the sounds of a phone ring, too. That must have been a hoot. Marlene’s embroidery is wonderful. I’m delighted to have it on my bed every day. As for Lindy in the box, I thought the same thing. I too remember squeezing into ill-fitting jeans. No more. I’m all about the stretch pants now. LOL. And yes, that it an Anna’s hummingbird overhead in the fruit tree. I’ve just written about another one today. They’re a delight. Serendipity is one of my most favourite phenomena, and I’ll never tire of it! Kate! This is gorgeous. What an amazing piece of quilting, too. Is this something you made recently? Thank you so much for sharing. I’m happy to hear that you too are a fan of serendipity. I’m seeking it out every day. It’s delightful It’s also a piece that draws you in. The layering is amazing. And that grassy fabric. Wow. Serendipity never goes out of style. I am a Word with Friends fiend (but always get beaten). And kowhai in spring is a splendid sight. Tuis; sadly haven’t seen one (yet) in Christchurch. I am not sure when the ‘trip’ is happening but if there’s a stop off in my city, I would love to meet you. You are so right! Serendipity never goes out of style. I’m happy to see you are a devoted fan as well. And you play Words with Friends. I would love to meet you next year. Our trip is planned for March. I don’t know how close you are to Dunedin, but I think Pauline is south and you might be north? There must be a meeting place. To come that far and not meet you would be a shame. Oh, I’m excited. There will be a way! All being well I should be available but with two very elderly parents I am always aware that I may have to drop everything and rush to Australia at a moment’s notice. I understand. I will hope for your sake and mine that all is well at that time. And of course, I hope your parents continue to enjoy life. My dad died when I was a child, but the rest of my family has lived into their late eighties and nineties. I was in need of a good smile tonight before I retire and even though I have your other post open to be read, this one seemed to need to be read first. I got such a tickle out of Mouse modeling the pillow. I liked the color you used for emphasis. Each one is unique even though the pattern is the same. I tend to pick different colors with each and play with them. Lindy in that box is a hoot. One stretches out as far as possible and the other squishes into the smallest space possible. I’m all about synchronicity. Monday I got a text that I would be picked up for embroidery group at 8:20. I didn’t know I was going as let my friend know I was unprepared as I had no prior notice. Shortly after I got a call from my son that someone wanted to come and look at the shelves he was selling. Would I be home. It worked out perfectly, and as of this Monday, all the shelves are gone! Perfect. I’m happy you found a way to enjoy the embroidery. And I too like to make use of things like old plastic bags. Synchronicity is a perfect word any day. Marlene, I’ve fallen behind again, but that just means I get to read your lovely words for a second time. The pillow is gorgeous. I see it every day and think of you, and how lucky I am to know you. Mouse probably assumes the pillow is his. If he were a man and not a cat, he would be insufferable. Instead he’s simply adorable. I like your observation of Lindy squished in the box, and Mouse spread out. I only occasionally see him scrunched up like Lindy. Oh Marlene, that made me laugh. I know all about good intentions and the mysterious and thieving time bandit. One does not need a paying job to be busy. You are involved with quilting and sewing groups, managing a home on your own, spending time with friends, and offering support for both children in numerous ways. You write a blog while managing many health challenges. Of course you’re busy! Serendipity is wonderful, and it’s a word that makes you focus on the simple, positive connections — connections you make so well, Alys. Your two cats are perfect models ~ I hope they know that they have made many people around the world smile! And that cushion is perfect, with the added bonus of being able to enjoy Marlene’s wonderful creation every day. Thank you, Anne. That is kind of you to say. I love making positive connections. I get a little thrill every time it happens. I’m pleased to hear that you smiled at the kitties. They too bring me pleasure each day. Every cat I’ve ever lived with has its own wonderfully unique personality. Did I already know you volunteered at the Herbarium? That’s delightful, Anne. I’m sure they are happy to have you. Thanks so much for the new words. I must put them in the notes section of my phone now so that I don’t forget them. xo I hope you have a pleasant weekend ahead. Ha! you made me smile, Lynn. Thank you. This is what makes you so special, Alys–you go actively looking for happy coincidences! I think they’re out there all the time and most if us don’t pick up on them but you do. There’s lots of cool stuff in this post and I guess you know I love the cats the best! Kerry, what a dear thing to say. Thank you. xo I knew you’d enjoy seeing Lindy and Mouse. They add so much love and grace and laughter to our days. I can’t imagine a world without animals. Serendipity: starting a blog in San Jose, and meeting kindred spirits from around the world. Falling in love with Love Those Hands at Home. That is serendipity, indeed! For me, too! Oh how fun! Sharon lived in Cedar Rapids for two years. The first year she was there they had the worst rain in 70 years. It flooded the entire downtown. The second year had record-breaking snow. As her disability progressed, sadly, she knew she couldn’t live there and deal with the weather. While in Iowa she fell near the pool at the Y and broke her hip. She spent a month in the hospital and nearly 9 months in rehab but she never fully regained her mobility, due to the MS. She moved back to California and now lives one mile from our home. I did go for a visit and helped her move back to San Jose. Everyone is nice, open, warm and friendly. We both experienced that mid-western hospitality everywhere we went. Thanks for sharing, Karen. Serendipity! Thank you, Sara! I agree. I’ve loved everyone of your clever and creative posts/projects. It’s been fun getting to know you. Thank you, Cathy. It is fun to say. Do you choose a word each year? I have no doubt that you often provide inspiration. That’s a great word to live by. I was so depressed after the election that I wasn’t in the mood for a word. I’m glad this came to me. I have to say, too, that the Republican defeat of their disastrous “healthcare” bill, has really lifted my spirits and has given me hope that our voices are heard and we can make a difference, even when we have a hateful bully in power. Mouse the Cat must have known intuitively how well she would look with that pillow. That second photo of her on the bed is priceless! Mouse is such a poser. I adore him from the tips of his whiskers to his tiny little toes. I think you’re right. Mouse the Cat has personality to spare. We adore him.